This is the second book in this great series. I forgot how much I liked these characters until I got back into this one. It's the 60's in a small town in North Texas and the whole town is terrified of a killer who is cutting people's heads off. The young, newly promoted Constable is in a bit over his head so his Uncle, the recently retired Constable is called back in to help along side he and the local Sheriff. This mystery is a strange one that delves deep into the compulsive behavior of an unbelievable hoarder. Cody, the new Constable and John, one of his men, must start on a treacherous journey through a warehouse where a hoarder has been living for years. Cody was a "tunnel rat" in the Vietcong War but even he is amazed and frightened by not only the sheer volume but also by the mindset of a person who could build this gruesome, boobie trapped maze. All the regulars are back and of corse our cantankerous Pepper and Top are smack dab in the middle of where they should not be. A fast paced well rounded mystery with a group of characters that I am looking forward to reading more about. Cody Parker maybe the elected constable of Center Springs, Texas, but it's still Ned, Cody's father, who gets the largest percentage of calls. So, it's Ned they call when a body is pulled from the nearby river. A headless body. It isn't long before the corpse is identified as an inmate from the nervous house. One of three who have killed their way across the Midwest. Now it seems they're in Chisholm. One of them, at least. Kendall Boden, and he isn't done with what he started.These stories are written in such a way that we're seeing much of it through the eyes of Top, Ned's grandson, as if we're hearing it told at a much later date. There is a nostalgic atmosphere to the story, event though its a murder mystery. Much different than a police procedural, much of the mid to late 60's and the rural culture of Texas family life shines through. The Burrows is the 2nd book in the Red River Mystery Series. I enjoyed The Rock Hole very much which is the first book. I wanted to continue with the series. Ned Parker, a retired Constable from Lamar County in Texas, is called out to the Red River to help recover a body caught in fishing lines. People out of habit call him when there is a problem. Ned calls his Nephew Cody Parker, who is the new constable, to come to the scene. What they discover is a headless body and it is just the start of finding gruesome headless corpses. Some one is getting even with people from their past.Who is doing these murders is discovered pretty early in the book. Now to find and arrest the individual. The trail leads to a building called the Cotton Exchange building that is five stories, six hundred feet long and one hundred feet wide. The kicker is that it is filled to the ceilings with hoarder stuff. The author described it like this. "This place is like a rotten apple full of worm holes." Cody who went into tunnels in the Viet Nam War and Deputy John Worthington who volunteers to have Cody's back go into this warehouse of horrors by tunneling on their stomachs holding a flashlight. They have to use extreme caution because the tunnels are bobby trapped. One wrong move means death. There are many horrors along the way. Some books fade with time after you read them but this book will stay with me due to the the burrows scenes.Another reason I like this series besides the story telling of the author is the characters. Besides being a mystery, it is also a book of family love and friendship. The reader gets to care for the characters. The time period is the mid sixties. On top of that, the general store has a bottle cap parking lot. I had to look that up as it was new to me. This is a very good series. I would start with The Rock Hole first if possible as it will make this book even more enjoyable. Once again, Reavis Wortham takes his mysteries into the world of literary writing. This second installment of his Red River Mysteries combines Tom & Becky Sawyer, 1960's Texas small town cowboys, Vietnam War veterans experiences in tunnels, and a touch of Steven King, to produce a fast passed thriller with a coming of age story. Ned has resigned as Constable but the towns folks continue to call upon him with their needs even though Cody has taken over this job. Truly, these two men, and Ned's counterpart in the Black community, John Worthington, work as a teem anyway, as titles are of little use to anyone In this small community. Ten year olds Top, and his precocious cousin Pepper, want in on all the action too. Though this may also result in whippings, and mouth washings with soap, their curiosity can not be thwarted! When a headless body is found in the surrounding waters, a nightmare premonition of Cody's seems to be playing out in real life. A hoarder of the first order has filled the five story cotton exchange with tons of "stuff", garbage, and booby traps. Pursuing a lead, Cody and John find themselves lost in a deadly maze of burrows, with rats, snakes, body parts, and explosives---and they are trapped within this whole deadly mess. Hopefully, Cody's experiences in the tunnels of Viet Nam will help them to get out alive. Everything seems to be revolving around a suspected "crazy" character from the town's past who needs to be caught before more headless bodies pile up. Again, great characters, thrilling descriptions, Texas humor, and twisted mysteries make this second book in this series a real winner of a book! Be sure to read the beginning in this series first--THE ROCK HOLE. Outstanding. This man can really write. Plus he has a real feel for the region, the individual characters and their world view (or lack thereof) and he demonstrates kinship with men of wide ranging ages. The women are another story.This is the second strong novel from this author and it’s quite dark and difficult. It’s the 1960s in rural Texas, near the Oklahoma border. A member of one of the larger families in and around Chisum has disappeared from a Midwestern asylum and appears to be murdering his way across the belly of the nation toward a quiet town. Ned Parker has retired after years serving as a town constable but people still call him when trouble arises.Ex-constable Ned Parker, hero of The Rock Hole, has plenty to keep him occupied. His two young grandchildren, Pepper and Top seem to always be underfoot, even in the most dangerous circumstances. In the hands of a less skilled author, this could be questionable. Not here. A large chunk of the central part of the action concerns the penetration by two deputies into a hoarder-packed abandoned industrial building. The section is long and could have been an attention killer. It is not. The continually rising tension is well-handled and maintains reader interest.This is a fine novel and a worthy successor to The Rock Hole. I heartily recommend it. As is true of all my review subjects, this novel was supplied by the publisher at no cost to me and with no expectation one way or other as to the possible resulting review. I loved the first book in this series, The Rock Hole, so I knew this one would be fabulous as well. Most of the same characters are back including Top, Pepper, Uncle Cody, Miss Becky and Constable Ned. Top and Pepper are still overcoming the terrors of the Rock Hole. I think it would be helpful to read that book first.Burrows revolves around as seemingly abandoned cotton exchange warehouse. In fact Cody was having nightmares about it for weeks before. Cody and Deputy John Washington head into the cotton exchange in searching for a fugitive only to find the horrendous example of a hoarder that anyone could hope to find. They are trapped inside the garbage filled monstrosity and undergo a terrifying journey through burrows or tunnels through the garbage to try to escape. This is an excellent read filled with tension-filled action scenes. The conclusion holds a real shocker, a twist that I didn't see coming at all. Wortham brings Chisum, Texas life along with all of its interesting characters. The 1960s small town in Texas is realistically portrayed. Hard to believe there was still a separation of blacks or whites to the degree that it was. And kin was still kin and you looked out for each other.Highly recommend this excellent thriller. It publishes in July. Wortham continues to impress me with his latest work, Burrows. This sequel to The Rock Hole is every bit as good as advertised. Burrows continues to follow the adventures and misadventures of Ned Parker, his family, and the residents of Center Springs, Texas in the 1960s. This book has you on the edge of your seat at times when the characters are in some very tense situations, but will have you laughing out loud just a few pages later.Wortham is a master storyteller and Burrows was a book that I could not put down. Although this book is technically a sequel to The Rock Hole, it is not necessary for you to have read the previous book to enjoy this book. That being said, if you have not read The Rock Hole, I would strongly encourage you to pick it up as well. I will be anxiously awaiting the third novel in this series! I thoroughly enjoyed the first book in the series. A 1960s Western coupled with the mystery was highly entertaining. This book on the other hand, reads more like a Dean Koontz novel. Perhaps if I enjoyed reading horror I would've rated this higher. But that's just not the case. The two children that provided humor and comic relief in the first book, were bratty in this volume. If the goal of this second book in the series was to leave you feeling creepy and in need of a shower, then mission accomplished. This book was published this year and I understand it is the 2nd of a series by this author. The scenario takes place shortly following the VietNam war. I'm enjoying modern mystery/thrillers with modern technology, cell phones, forensics, DNA, GPS, etc. If a reader doesn't care about those details, then I would say, imho, that this was a good story. I guess I just like alot of "bells & whistles." Overall pretty good. Sometimes the author would switch POVs within the chapters, but overall well written. It was rather gruesome at points and the tunneling coming in the maze was very graphic and vivid. I liked the twists on the villain. I had suspected that person early, but was still surprised by many details. Overall, this was an entertaining read with likable characters. I settled into the story quite well because of the storytelling. There are lots of good things about this book, and only a few things I would change (if I was the writer).This is an excellent Book Club book because of the diversity of characters. Withhold'n mah ratin' til after bookclub. The author certainly keeps you on the edge of your seat! Some parts were difficult to read because they are so vivid -- I had to put it aside for a day or so -- but the story line is solid and the characters are believable. Entertaining for sure. Looking forward to the next one. This one had me on the edge of my seat and places where I struggled to catch my breath...I won't tell you why, but you'll figure it out soon enough. Wonderful book! I am really loving this series. The author does a fantastic job of creating characters you can care about. His descriptions of rural Texas in the sixties makes me feel like I am there growing up along with Top and Pepper. I can't wait to read the entire series! I think it's best to begin my comments with a warning. If you are extremely claustrophobic, you might want to give Burrows a pass. I am, and I almost didn't make it out of the Cotton Exchange with my sanity intact. Now I can hear what you're thinking. If I'm so claustrophobic, why did I keep reading the book? Was someone holding a gun to my head? Well... no. No gun to this head. But the reason why I couldn't stop reading is because Reavis Wortham is a powerful storyteller whose words can grab you by the throat and not let go. From the chilling opening scene, I could no more stop reading than I could stop breathing.Once again there's more to Wortham's Red River mysteries than murder and mayhem. These two books are a pitch-perfect evocation of a time. In 1964, I was a couple of years younger than Ned Parker's grandson Top, but I also played "Combat" and rode my bicycle around town and country getting into things I knew I shouldn't be getting into. If Scotty were to beam me to Center Springs, Texas in 1964, I'd feel at home, and no one would have to tell me to be careful with the gossip who listens in on the party line. Although Top and Pepper don't have the big roles they did in The Rock Hole, Wortham lets us see how they're dealing with what happened to them in the first book. Both children are having problems, and Ned deals with Top's acting out just like my mother and grandfather would have dealt with me. (There are many benefits to living in a small town.) Do you have to read The Rock Hole to make sense of Burrows? No, you don't, but you're probably going to finish this one and then get your hands on that first book as fast as you can.There's a running joke throughout this book in which people are constantly telling Ned Parker, "I thought you was retired!" It reminded me of "Big Jake," a John Wayne film in which everyone thought Wayne's character was dead. "Not hardly," said the Duke, and when he finally got tired of it, he said, "I'm going to shoot the next person who says that!" I was hoping that Ned Parker didn't run out of patience like John Wayne did.If I have one complaint about Burrows, it's the fact that I think the crawling through the Cotton Exchange went on just a bit too long, but I don't know if that's a reasonable observation or my claustrophobia talking. One thing I do know-- the Cotton Exchange now tops Shirley Jackson's Hill House on my list of places that creep me out: "The anxious men beside the radios chuckled nervously and continued to watch the building. They were frightened by the entire horrific night, the Ghost Man, a demented murderer who had already taken one man's life, and a frightening building that was possibly digesting two friends at that very moment. "If there's one author I'm glad I discovered in 2014, it's Reavis Z. Wortham. The man certainly knows how to write the kind of story that makes you realize reading it is much more important than a good night's sleep. I got this book from "Girlfriends' Weekend" in Jefferson, Tx where I heard the author speak. Although I like mysteries, this one has a touch of psycho-thriller. Although I was creeped out, I couldn't stop reading. I grew up in East Texas so the dialogue and culture were spot on. I liked how the narrative bounced between Cody, the constable, Ned, the retired-constable grandfather, and young Tap. Unique story, good read. Many of the characters in this book were introduced in ROCK HOLE, and I'm not sure how much I brought to this story from my previous knowledge of them. I'm not sure how I would have liked this title if I had just picked it up cold, although this was a good story with a surprising twist. VERY well done was the description of being in the burrow--I was there with the character(s). I recommend reading ROCK HOLE first, but these are both well worth the time. This is my first novel by this author and it was a quick read. I enjoyed this story. It was always in constant motion. There were plenty of bread crumbs throughout the book and I still didn't see the ending coming. The author did a great job in setting the stage and and putting some quirky characters in place. I wish could have been pulled in more by them though. This is the second of a series. Now I need to find the first one. This was a good mystery story set in North East Texas along the Red River border with Oklahoma. I enjoy the main characters, Ned, Cody, and John the local lawmen. Together with Ned's grandkids, Top and Pepper, they solve murders in the mid 60s. There are lots of references to the War in Vietnam and the music of the day. With the crime setting in an old factory filled to the brim with garbage and built by a former "tunnel rat" from Nam this was a claustrophobic, but scary-good read. While I really enjoyed the first in the series, this one lost the rustic charm. The story is darker, more graphic and the characters not as well drawn. Way too much time in the gruesome Exchange building and the shift from the young boy's viewpoint to third person was wearing. I did not finish the book. By the time John and Cody were out, I didn't care what happened. The second book of the series was good, but since I am mildly claustrophobic, I had to skim through some of the scenes in the killer's lair. I still like the characters and the setting, and I hope Mr. Wortham continues. Good mystery taking place in Texas near the Red River where a body is discovered tangled in a fisherman's trotline. This is the sequel to Rock Hole, but after requesting both from the library, this one came in first. I have now received RH and plan to begin it next week. 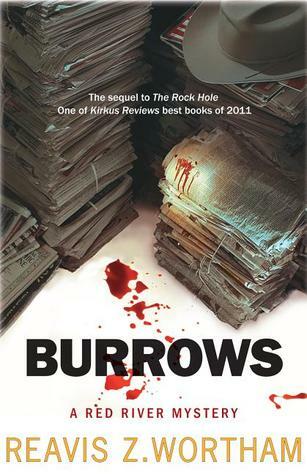 Burrows, the second book in the Red River Mysteries series, was dark and claustrophobic. Reavis Wortham's writing is incredibly descriptive which allows the reader to easily visualize the action in the book. The characters have become like family to me. Reavis Z. Wortham's BURROWS has the wonderful, rich characters and local flare that reminds me of one of my favorite authors, C.J. Box, while scaring me to death with the simplest, every day items that reminds me of a Stephen King nightmare. Fabulous, character driven thriller! There is nothing about this book that I like. From the foul-mouthed little girl to the time period to the plot to the descriptions of the action, it is all awful. Excellent story set back in the 60's in a little Texas town. Great characters and interesting plot. Reavis Z. Wortham - Reavis Z. Wortham retired in 2011 and now works harder than before as the author of the critically acclaimed Red River historical mystery series. Kirkus Reviews listed his first novel, The Rock Hole, as one of their Top 12 Mysteries of 2011. True West Magazine included Dark Places as one of 2015’s Top 12 Modern Westerns. The Providence Journal writes, “This year's Unraveled is a hidden gem of a book that reads like Craig Johnson's Longmire on steroids.” Wortham’s new high octane contemporary thriller from Kensington Publishing, Hawke's Prey, featuring Texas Ranger Sonny Hawke was released in June, 2017.